Here we are on our "fact finding mission" in Thimpu, Bhutan. In the center is Lopen Pema Dhundrup with Matthew and Mary Kelly on either side. There was so much that was needed, it was hard to know where to begin. After three extended visits to Bhutan we had an excellent grasp as to what projects would make the greatest and most lasting impact. Dhyana Winkler, Jim Winkler's daughter, (not pictured here) told Lopen Pema she might like to live in Bhutan for several years. Pema told her that he received one bowl of rice a day, but that if she came there to live he would happily share half his rice with her. Are these kids irresistible or what? 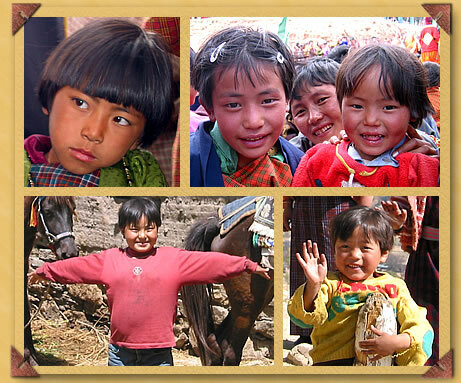 Here are a few assorted photos of some young Bhutanese girls. These youngsters have not been tainted by western media, television violence or video games. Their playgrounds are still the farms and forests of Bhutan. Through these projects we hope to empower women in Bhutan to continue living full and meaningful lives.